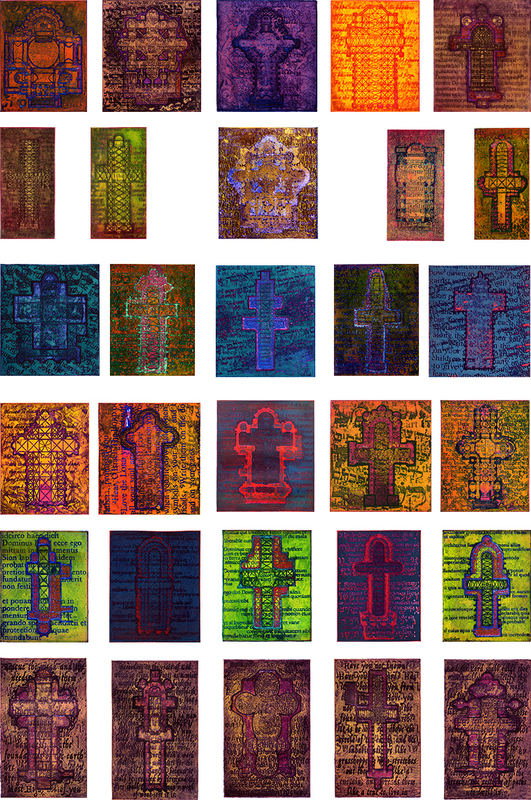 These works are based on images of Cathedral Floor Plans. 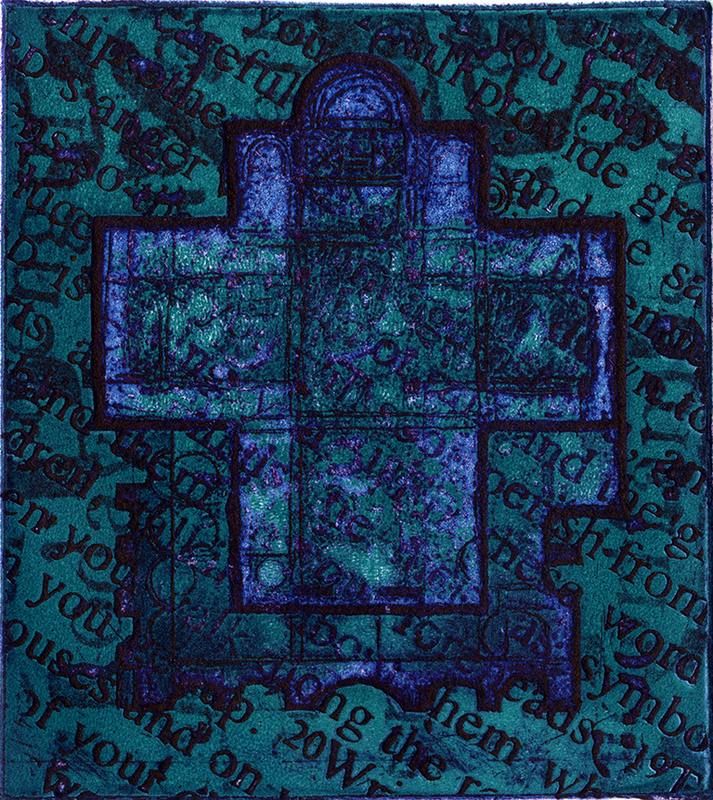 They are the second series of etchings using that imagery and employing the technique of color viscosity printing. The technique, originally developed in the mid-twentieth century by Stanley Hayter and Krishna Reddy at Hayter's Atelier 17 in Paris, allows an etching plate to be inked with at least three colors simultaneously. Though multiple variations of colors can result from the mixing of the three inks, the plate may be run through the press in just one pass. Some of the original series of images can be found here. These works, as well as the Palimpsest Portrait etchings, are part of Con-Text: The Word Based Images of Tyrus Clutter, an exhibition at the Appleton Museum of Art in Ocala, Florida. All the works from that exhibit incorporate textual passages, like much of the artist's work. Six of them explore the similarities between fundamentalist faith in both the Jewish and Christian traditions, where the Word takes on a huge significance. Text makes up part of these images; both Hebrew and English texts from the Old Testament. The remaining images integrate multiple Biblical passages in English, Hebrew, and Latin, often containing the words “foundation” or “plan.” For a further assessment of this check out Tyrus's Eye on Art. You can also see how some of those first works were made into an artist’s book. The video below shows how the etching plates are developed and printed with this particular technique. These Cathedral Floor Plan etchings have been developed into a traveling exhibition entitled: For I Know the Plans I Have for You. Booking for the exhibition has already begun, with openings starting in early 2018. The exhibit consists of 30 framed etchings (as seen here). Information about the concept and printing process is provided. Venues are responsible for shipping to the next venue, insurance, and a $200 rental fee for four weeks. The rental fee may be applied as an institutional credit for the purchase of artwork. To book the exhibit or find out about availability contact inquiries@tyrusclutter.com .